The Australian, 26 January 2000, p.1. Designer Franck Gentil′s proposed new Australian flag won the hearts of the Ausflag judges over 99 others. A simple swap of a big Federation Star for the Union Jack in the corner of the Australian flag has been chosen by a panel of design experts as the best candidate for a new national flag. Designer Franck Gentil′s effort was chosen from 100 finalists by the professional judges after a competition with thousands of entries. "I′ve been thinking about a new flag for as long as I can remember," Gentil, 35, of Lewisham in inner Sydney, said yesterday. "I think the existing flag is fine, but all flags evolve and I think it′s time for change." The 100 designs were exhibited around the country by Ausflag, the Sydney-based organisation pushing for a new Australian flag, during 1998, but the results were held back until now so as not to confuse last year′s republic referendum. While the judges liked the simplicity of Gentil′s vision, the public preferred the judges′ second pick, a more radical change that adds a golden kangaroo to a large Federation Star. 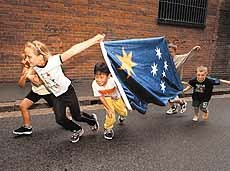 Designed by George Margaritis of Marcus Lee Design of Richmond in Victoria, the kangaroo flag was conceived for "the unknowing". "Australians all know about the Southern Cross, but it wouldn′t mean much to anyone seeing it across the fields of Russia," Margaritis′s design partner, Marcus Lee, said yesterday. "For that reason we thought it was appropriate to put on the kangaroo." Mr Gentil, of the Sydney graphic design firm Gentil Eckersley, submitted 10 entries and was delighted when seven made the final 100. "There are historic reasons for the existing flag, but if it evolves then we can have something everyone, no matter what their background, can see with a degree of ownership."